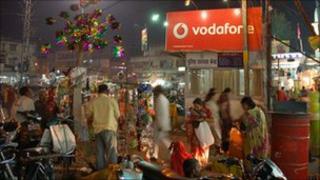 Vodafone has finally agreed terms for the buy-out of its partner Essar from its Indian mobile phone business. The UK firm will pay $5.46bn to its Indian counterpart to take Essar out of its 33% stake in the Indian subsidiary. It will leave Vodafone owning 74% of the Indian business, while the other 26% will be owned by Indian investors, in compliance with Indian law. The deal - originally announced in March - ends a relationship with Essar that had become increasingly strained. The two firms had clashed publicly over plans by Essar to reorganise its ownership of the Indian business in a way that Vodafone claimed would not value the company correctly. Essar had accused Vodafone of trying to force it out of the company, while local Indian newspapers reported that the Indian partner had been trying to get Vodafone to pay more for its exit. Vodafone has faced a string of problems since entering the Indian market in 2007, including a £2.3bn write-down - 25% of the business's value - due to rising spectrum costs, and a disputed $2.5bn tax bill from the Indian authorities.